TALLAHASSEE — Two House Republicans unwittingly revived hopes this month that lawmakers could compromise on a proposal to expand Medicaid. “Lawmakers say Medicaid expansion not dead” read the headline in the Sarasota Herald-Tribune,highlighting comments from Manatee County Reps. Greg Steube and Jim Boyd. Medicaid expansion, or some alternative, remains a long shot. TALLAHASSEE – A panel of Florida lawmakers today is taking up a privatized alternative to Medicaid expansion that could result in as many as one million low-income Floridians qualifying for the first time for subsidized health-care coverage. The plan, nicknamed “Negron-care” for its Senate sponsor, Joe Negron, R-Stuart, is the Legislature’s first attempt under the Affordable Care Act to look at a way to insure people who are poor, but not poor enough to qualify for existing Medicaid coverage. “I’m optimistic we’re going to get it done,” Negron said. But there are still a lot of unanswered questions about Negron’s plan, including whether the House – and the federal government – will agree to it. Alysia Peddy, a mother from Tampa, is making her voice heard in the debate over Medicaid at the state Capitol. Peddy considers her family’s medical situation a prime example of why Medicaid is working and should be expanded in Florida. Her 9-year-old son Pierce requires between 15 and 20 hours of nursing care a day because of a traumatic brain injury. 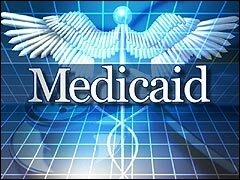 Governors who refuse to expand their Medicaid programs for the poor may cost employers in their states as much as $1.3 billion in federal fines, a study found. A clause in the 2010 health-care overhaul penalizes some employers when their workers aren’t able to obtain affordable medical coverage through the company. Employers can avoid those fees if their workers qualify for Medicaid as part of an expansion that as many as 22 states have rejected, according to a report today by Jackson Hewitt Tax Service Inc.
A Florida Senate committee voted Monday against expanding Medicaid to roughly 1 million of the state’s poorest under the federal health overhaul and instead proposed a voucher plan that would require patients to pay premiums and co-pays. Hospitals, consumer groups and Democrats celebrated Thursday as they recovered from shock over Gov. Rick Scott’s change of heart on Medicaid expansion. Tea Party leaders tweeted moans about betrayal. Legislators reminded Scott it’s not over yet. Gov. Rick Scott and other Republican governors want to meet with President Barack Obama to discuss the federal health law, including ways to expand Medicaid and set up online health exchanges that are more affordable for states.